Whitsunday tour operator, Ocean Rafting, won gold at the Queensland Tourism Awards 2017 in Brisbane on Friday night, winning the award for Major Tour and Transport Operator. The win follows recent success at the Whitsunday Tourism Awards, where Ocean Rafting won gold in the same category. The team also took home the Bronze award in the Adventure Tourism category and sister company, Ocean Safari, based in Cape Tribulation, came home with a silver award in the Tour and Transport Operator category. Owners Peter and Jan Claxton attended the Queensland Tourism Awards 2017 ceremony and spoke proudly of their achievements in the three different categories. 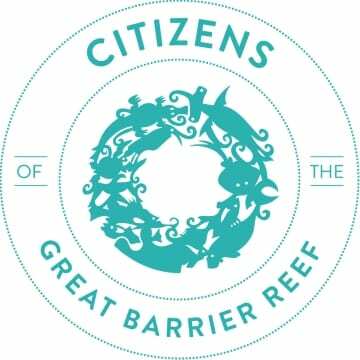 “It is extremely rewarding and we are full of pride for our teams in both the Whitsundays and Cape Tribulation. Both businesses offer such unique experiences for guests and they are constantly evolving and growing. Our staff play such a big part in all of this and absolutely love what they do and the beautiful natural playgrounds they visit every day,” said Ms Claxton. It has been another big year of growth for Ocean Rafting, with the arrival of a sixth vessel, the order of a seventh vessel and the company’s recent 20th birthday celebrations in October. “Twenty years of operation was a huge milestone for us, which we enjoyed celebrating with industry partners. We are so proud of our team and thank everyone for supporting Ocean Rafting over the years,” said Ms Claxton. This is the second consecutive year in a row Ocean Rafting has won the Major Tour and Transport Operator category at a Queensland level and also won gold at the last year’s Australian Tourism Awards in the same category. Ocean Rafting will once again be automatically entered in the upcoming Australian Tourism Awards due to be held in Perth early next year. Ocean Rafting operates a fleet of six vessels and two exciting day tour options to some of the Whitsunday’s most desirable destinations, including Whitehaven Beach and Hill Inlet. 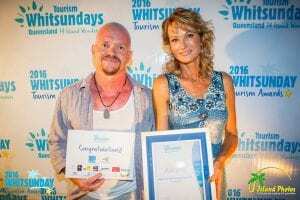 Ocean Rafting enjoyed success on Saturday night at the glamorous Whitsunday Tourism Awards held on Hamilton Island. 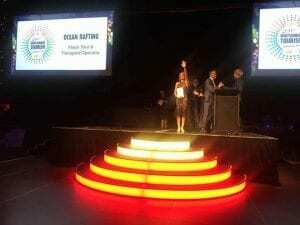 Ocean Rafting scored two gongs, taking home the gold award for the Major Tour and Transport Operator category, as well as bronze in the Adventure Tourism category. Ocean Rafting owner Jan Claxton, was ecstatic to receive both awards which was proudly shared with a large contingent of staff on the night. “In what has been a challenging year for everyone, it was wonderful to see the tourism industry coming together to celebrate the industry’s night of nights. We invited most of our staff to enjoy the evening as we are so incredibly proud of them and their contribution to the ongoing success of the business,” said Jan. Ocean Rafting saw the arrival of a sixth custom built vessel this year and has since submitted an order for a seventh vessel due in the near future. “Winning the Major Tour and Transport category for the second year in a row is a significant achievement for us and can be attributed to our ongoing growth and commitment to delivering exceptional tourism experiences in the Whitsunday region,” said Jan.
“Of course we would like to thank everyone who supports us, including local agents, industry partners and our guests and also extend a big congratulations to all the other winners on the night,” said Jan. Ocean Rafting was a winner in the same category at the 2016 Australian, Queensland and Whitsunday Tourism Awards and is once again an entrant in two categories at the upcoming 2017 Queensland Tourism Awards. 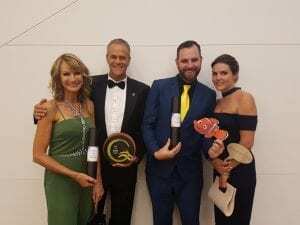 Ocean Rafting achieved national success at the Australian Tourism Awards in Darwin on Friday night, winning the award for Major Tour and Transport Operator. Owners Peter and Jan Claxton were ecstatic with their success on the evening. “It really is very special to have won at the Australian Tourism Awards on a national level, especially in the “Major” category. We’ve built two new custom made vessels in the past two years to bring the fleet to six, so it has been a big period of growth operationally. We really want to thank our staff, who do an amazing job day in and day out and have contributed to the overall success and reputation of the business. We can’t fail to also thank all of our guests, agents and industry partners. We are so incredibly proud of this award as we work so hard to always improve the operation and to invest in the business, and will continue to do so. It makes it so much easier to market our destination when you have an accolade like that,” said Jan.
Peter and Jan were also quick to point out that they are extremely proud to be based in the Whitsundays. “We operate in the one of the most beautiful places in the world, the Whitsundays, and have the opportunity to showcase one of Australia’s most iconic beaches, Whitehaven Beach and Hill Inlet, on a daily basis,” Jan said. Peter and Jan have owned Ocean Rafting since 2001 and have since built the fleet up to six vessels, as well as establishing a sister operation in Cape Tribulation, Ocean Safari. Each vessel takes a maximum of 25 to 32 passengers, with small groups allowing guests to experience tropical paradise away from the crowds. Ocean Rafting operates two exciting day tour options to some of the Whitsunday’s most desirable destinations. The Northern Exposure and Southern Lights tours are both fully guided and include an exhilarating ride to Whitehaven Beach, pristine snorkelling reefs and guided Whitsunday Island National Parks walks. Ocean Rafting is the only tour to have direct access to the stunning and iconic Hill Inlet beach and special snorkel sites at Hook Island and Border Island ensure a memorable underwater experience. Ocean Rafting best Major Tour Operator in Queensland! Ocean Rafting won gold at the Queensland Tourism Awards in Brisbane on Friday night, winning the award for Major Tour and Transport Operator. The win follows recent success at the Whitsunday Tourism Awards, where Ocean Rafting won gold in the same category. Owners Peter and Jan Claxton, who attended the awards ceremony, spoke proudly of their win. “We are just so happy to win this award as it reflects such a huge achievement. We have grown so much that we now have to enter the “Major” category. With two brand new custom built boats joining the fleet in the last 18 months, it has been a big period of growth operationally. It is extremely rewarding and the industry is so positive in general, so there are many more exciting times ahead,” said Jan.
“The Whitsundays just did so well overall at the Queensland Tourism Awards and we are extremely proud to be a part of such a strong Whitsunday contingent, with the region taking home four Gold, four Silver and three Bronze awards in total. We pass on our congratulations to all the other winners and must make a special mention to our amazing staff, who are the heart and soul of our business. We also extend a huge thank you to all of our guests, agents and industry partners,” said Jan.
Peter and Jan also own sister company Ocean Safari, based in Cape Tribulation, which came home with a bronze award in The Steve Irwin Award for Ecotourism category. “It was a very special experience to come home with two awards at Queensland level,” said Jan. Ocean Rafting will now automatically be entered in the Australian Tourism Awards due to be held in Darwin in February. Peter and Jan Claxon have owned Ocean Rafting since 2001, operating a fleet of six vessels and two exciting day tour options to some of the Whitsunday’s most desirable destinations, including Whitehaven Beach and Hill Inlet.